Nice guy, actually. 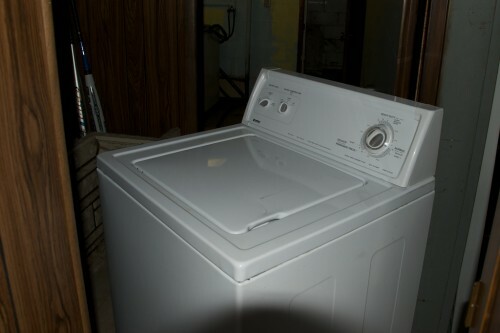 I think I probably overpaid for the washer by $45, but there just aren’t many used washers available on the Pittsburgh Craigslist right now. I should probably have waited for the semester to be over, but I haven’t been able to locate a laundromat that isn’t in a scary ghost town part of Pgh and — yeah. Grew up in Brookline (a part of Pittsburgh). Went to the Catholic high school because he didn’t want to go to the Pittsburgh public high school. Put himself through high school making $0.50/hour doing odd jobs for the school. His father always wanted to move the family to Lincoln Place, but his mother wouldn’t let him. He bought his truck from a transit authority employee who lived in Lincoln Place. He thinks Lincoln Place is the best part of Pittsburgh city (although he might have just been being nice). Before that, he did HVAC systems. Although when he first got out of high school, he did masonry work. His high school was a college preparatory school, although he had no intention of going to college — he just didn’t want to go to the Pittsburgh public school. Any time a teacher seemed unlikely to pass him, he told him/her that he couldn’t study as much as he wanted to because he had to work odd jobs in order to afford to go there. He kind of thinks he might like to go to college now, although he’d prefer it if the classes were mostly three hours once a week, rather than three times a week at 45 minutes a pop. He went to a trade school to learn HVAC and that was all right. He has two daughters, both of whom attended Robert Morris (University). The one is brilliant and if you have her read 40 pages of something, she can recite it back to you. The other one takes after her father and if she reads those pages 40 times, can’t remember a thing. The other daughter was smart enough to talk the school into allowing her to take night classes for her undergraduate degree because, she told them, she was poor and had to work during the day. She wasn’t poor — she just preferred having class once a week and at night. Now she wants to get a PhD, but he’s not sure she and her husband can afford that. Whenever boys would come pick up his girls for a date, he would tell them that if he smelled alcohol on their breath when they brought the girl home, they would end up being buried in the backyard. Although he and his father-in-law made their own wine and, when his kids were old enough (high school? ), they were welcome to drink. He always invited their high school dates to come in and have a drink of wine, but none of them ever wanted to. His wife has seasonal affective disorder in the winter time. He’d kind of like to move to Florida for the weather, although Pittsburgh weather mostly affects his wife, not him. Plus, he doesn’t want to move because his daughters still live in the area. The other fifteen minutes of the discussion was mostly about weather. As it gets slowly walked back into position. The water hoses that came with the house leak with great ferocity, so I have to go out and buy new ones. As a consequence, I had to raid my old suitcase for more underwear and t-shirts. “Clean, Dry Clothes by Friday!” is my new mantra. PS, Yes, I got the drum sander and started on the floors last night — will update on that later. Also got Red Dead Redemption and got started on that yesterday afternoon. How long was this transaction? WOW! About a half hour, but you know — gotta make the most of it. I also learned that being on extended disability is probably kind of awful. Good, compact work triangle in the kitchen. Good timing on the shutter to catch the tin strip in motion. You should wear gloves. Goggles never help (unless you are grinding); hands get butchered — at least mine do. The agent may know re-sale points, but fashions change in the course of a PhD program. Query: If staying in Sheridan en route to Curlew, should a Yellowstone or Glacier attempt be made? Both scenic drives (Norbeck & Spearfish) or which is better in SW So. Dakota? I’m trying to develop calluses. Are you going to get out of the car at Yellowstone/Glacier? If not and it’s either-or, probably Yellowstone. Glacier you kind of want to get a couple miles off the road when you go there. I liked Glacier way better than Yellowstone, but — you know. Don’t remember Spearfish, but Norbeck was awesome and had really cool engineering. I’m guessing they didn’t need to engineer the road the cool way, but WPA and so forth. Plus I saw a wild burro.